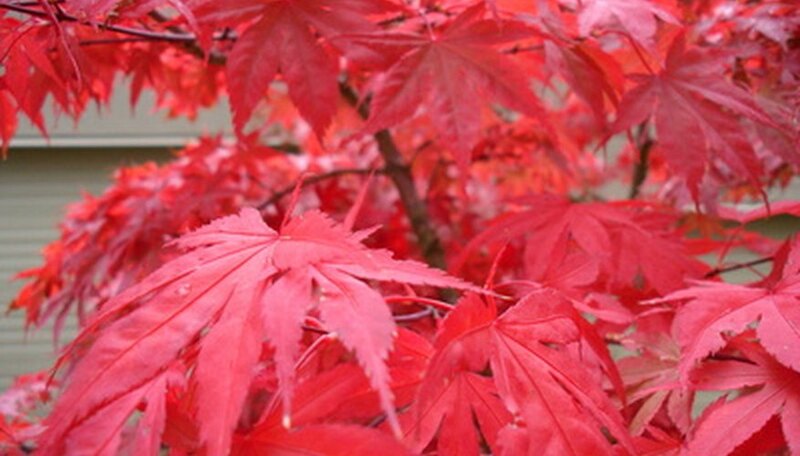 Japanese red maples are popular trees in landscaping. Not only do they create a stunning contrast with their vibrant red leaves, but also are they an easy tree to care for, requiring little maintenance. The Japanese red maple is a small but fast-growing tree which requires some direct sunlight to acquire its dark red leaf color. Too much summer sun, however, will turn its leaves such a dark shade that they may appear purple or brown. If you plant your Japanese red maple where it will have well-drained soil, some afternoon shade and some relief from winter wind, your tree will do well with minimal care. Apply mulch 3 to 6 inches deep around your Japanese red maple tree every spring. Do not put the mulch right up against the trunk of the tree. Water your Japanese red maple during the hot, dry summers. Give its roots a good soaking in the early morning or evening. Young Japanese red maples, especially, need a lot of water. Give your newly planted tree plenty of water. However, if they are not in well-drained soil, the roots could easily become water-logged, and this could kill your tree. Trim away the damaged parts of the leaves if your Japanese red maple is damaged by a late spring frost. The tree will recover from the damage after about a month. Start pruning your Japanese red maple when it is well-established--usually two or three years after you have planted it. In late autumn, remove diseased or damaged wood and thin out the central area of your tree, if it has become crowded. Japanese red maples do not require pruning to maintain their shape, but by removing smaller limbs and stems from the central area you can increase air flow and prevent fungal disease. Use compost, hay, leaves or straw as mulch. They will not only maintain moisture but will also add nutrients to the soil as they break down.